In airport news, United plans some operational changes at Houston Bush Intercontinental; Los Angeles International gets a popular new eatery for Delta flyers; Newark’s Terminal C adds several dining options; Southwest opens an international concourse at Ft. Lauderdale; and Seattle issues leases for several new concessions. United Airlines said this week it will change its scheduling at Houston Bush Intercontinental this fall to offer “shorter, more convenient connection times and better access to more destinations.” Specifically, United plans to “rebank” its flight operations at IAH on October 29, shifting from the current 10 daily flight banks to eight. (A flight bank is a window of concentrated arrivals and departures.) 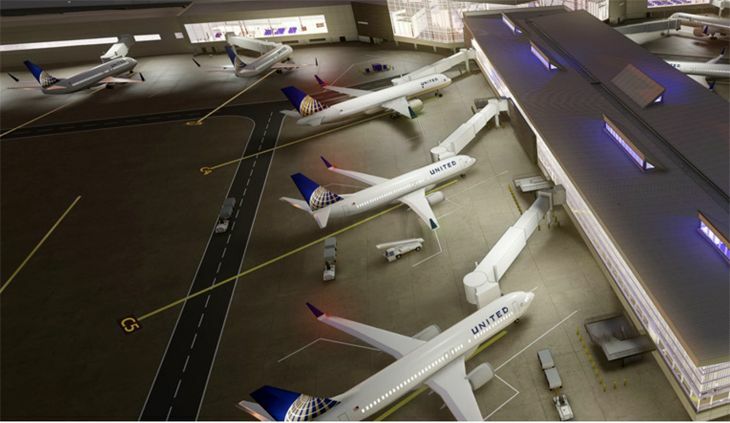 Besides making for shorter connections, the airline said, the change will let it better utilize its 90 gates at IAH and “use aircraft more effectively throughout the entire country.” And in 2018, United said, it will finish its $277 million investment in the airport’s C North concourse, offering more spacious gate areas, improved technology and new dining options. Los Angeles International’s Terminal 3, part of Delta’s new home at the airport, is opening a new comfort food mecca this week: Shake Shack. The fast-growing fast-food favorite started with one location in New York City 13 years ago and now has 130 worldwide (including 80 in the U.S.). Its specialty is hamburgers (all-natural, antibiotic-free Angus beef), but it also offers chicken, hot dogs, fries, frozen custard and breakfast sandwiches. It’s open from 4:30 a.m. to midnight. The chain opened its first Los Angeles location last year in West Hollywood and now has five in the area. That long-term overhaul of concessions at Newark Liberty International’s Terminal C – United’s hub – has opened three more dining venues. But there are actually six, because these new Terminal C eateries have one identity for breakfast and then change to a different one for lunch and dinner. For lunch/dinner, the new venues include Wabi-Sabi (Asian street food), Notorious P.I.G. (barbecue, of course) and Uptop Pizzeria (build your own pie). Earlier in the day, they serve up something totally different as Crepe Juliet, Flip Flop Pancake Shop and Breakfast Boli. Two months ago, the terminal opened two other split-personality eateries – Eggy Weggy and Supreme Bowl in the mornings, then Custom Burger and Philly Cheesesteaks later in the day. 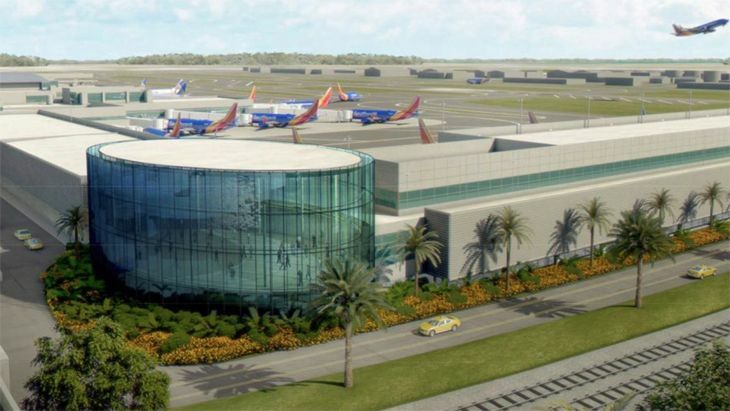 Southwest Airlines is due to cut the ribbon this week on its new Concourse A linked to Terminal 1 at Ft.Lauderdale-Hollywood International Airport, which will house the airline’s growing international operation at FLL. The new concourse has five gates that can handle both international and domestic flights, as well as a Customs and Immigration facility. It has several new shops and eateries – and even a pet restroom. Southwest flies to Nassau and to Cuba from FLL, and this month added new routes to Belize City, Grand Cayman, Cancun and Montego Bay. 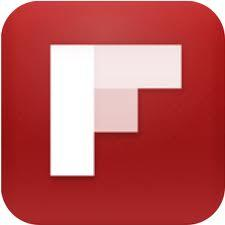 It plans to start service in November from FLL to Providenciales in the Turks & Caicos. Travelers at Seattle-Tacoma International can look forward to plenty of new food and beverage options in the months ahead. The airport has just awarded leases for a couple of dozen new outlets, representing all kinds of global cuisine and branches of local favorites, as well as new retail stores. The biggest is probably the Marche Food Hall, which will be in Concourse A at Gates A5 and A6. It will include a juice bar, a bakery, an ice cream shop, a burger restaurant, a coffee shop and a beer bar. Other new options will include two locations of Starbucks Urban Market (selling news publications, sundries and travel necessities as well as the usual Starbucks fare) and eateries ranging from Asian to Italian to Alaskan seafood and more. You can see a full list here. The airport plans to boost the number of retail outlets and restaurants from the current 86 to 135 in the years to come.